I just finished first version of our scenery editor and created this small airport which I am using as my testing field. I am still working on the shadows so there are some artifacts that have to be fixed. The scenery editor is used for placing in models right? Yes exactly. We will publish some video about that later. That looks so cool! From far away it looks like AREA 51! TOP SECRET BLACK PROJECTS! Is the Runway done with the road tool? Also is the concrete floor of the hangars part of the model or were they done with the road tool as well? Or some other kind of terrain editor / painter? 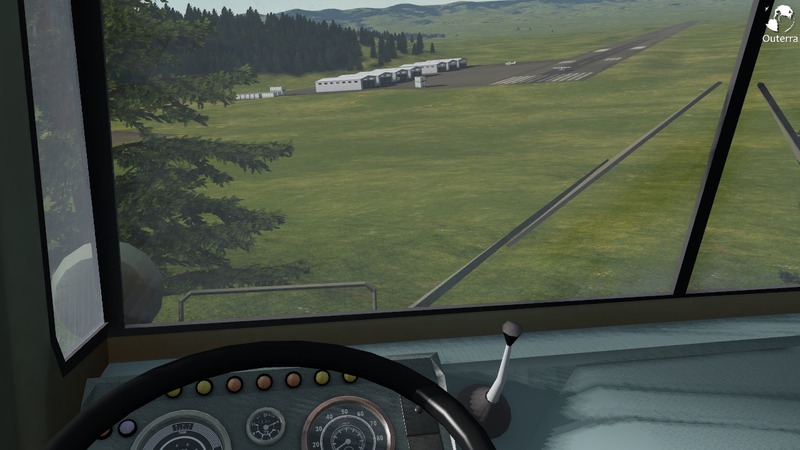 The airport looks excellent, and it should be included in any demos you put out. I'd like to make a suggestion for the next vehicle we see: Can we have a Spitfire Mk Ib? After all, everyone loves Spitfires. Or a Spitfire MkXIVe with clipped wings? Either of them could be based at your airport. Yes the runway is using the same system as the roads, but it's got its own control page in the UI. 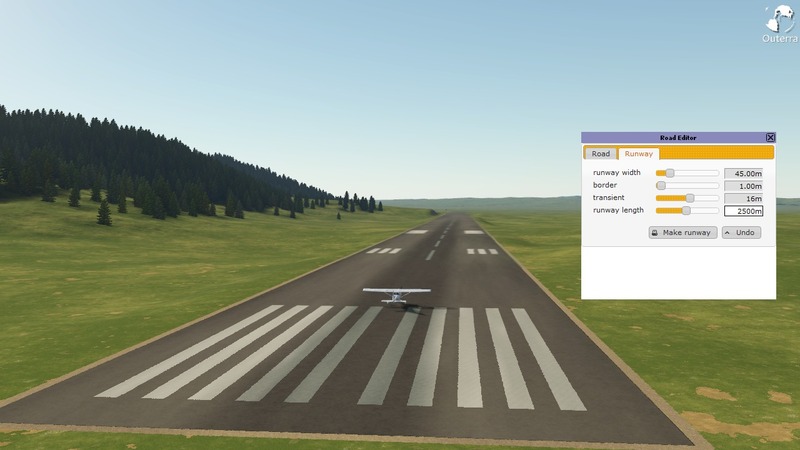 Placing a generic runway anywhere in the world is simple - adjust the parameters and push Make runway. Currently there's just one generic type defined but there will be more. The floors are done separately from the buildings, and they can be done in two ways - either by using autoleveling or by placing a pad. Autoleveling will create a rectangular pad under the building's bounding box, whereas manually placed pads do not have to be rectangular. 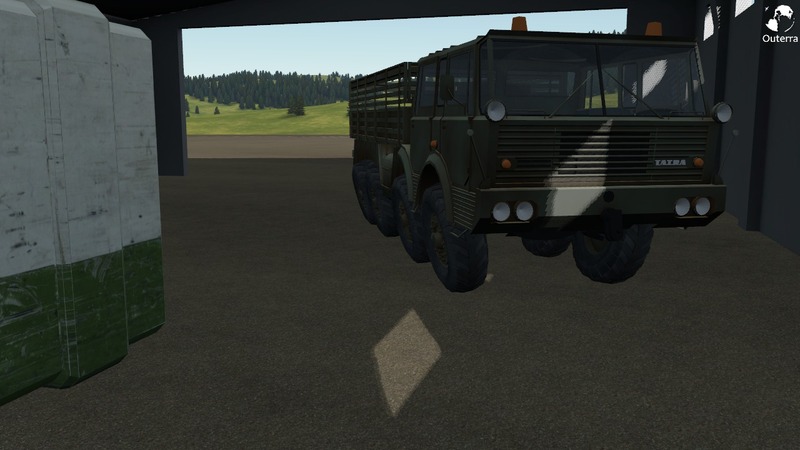 Apart from leveling the terrain these can also modify the underlying material to make a dirt/gravel/asphalt surface there. Oh wow that's a pretty nifty tool there! Looks great so far. What other tools have you done for the terrain? For example the auto level tool. Is there a raise or lower terrain tool yet? You know to help with the scenery Editor in placing buildings and getting a certain landscape configuration for them at different altitudes. Apart from leveling the terrain these can also modify the underlying material to make a dirt/gravel/asphalt surface there. But please can you also support "sloped" runways whereby the terrain under the runway is not flattened. Most real world runways undulate somewhat. edit: Also, those are very hard edges around the runway. 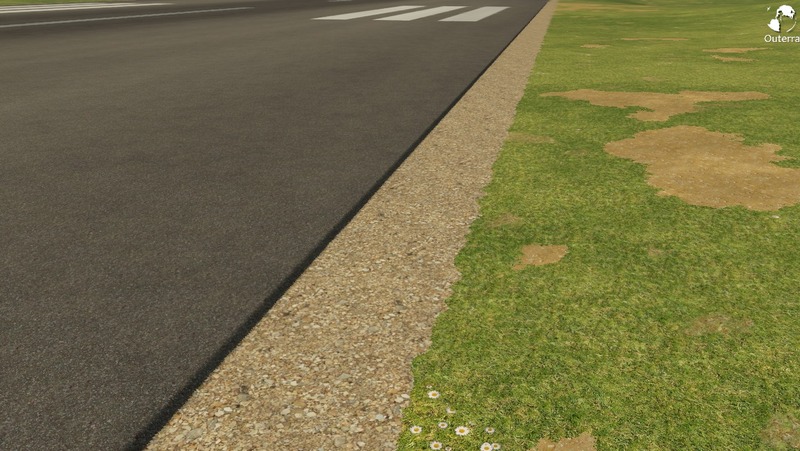 I realise this is early days but can you support more naturalistic blending between the asphalt, dirt skirting and grass? The dirt should "bleed" over the asphalt just a little and the grass over the dirt. Maybe it could be an option, hard versus natural edges? Is there a raise or lower terrain tool yet? You know to help with the scenery Editor in placing buildings and getting a certain landscape configuration for them at different altitudes. There's no specific raise/lower tool, but the autolevel will raise or lower the terrain automatically depending on the elevation you set for the building. Yes, it's no problem - the runway is still a spline road in essence, so if the elevation at the spline points was taken from the underlying terrain it would create a wavy profile as well. But the elevations should be taken from a coarser level so that the waves are subtle. Also, those are very hard edges around the runway. 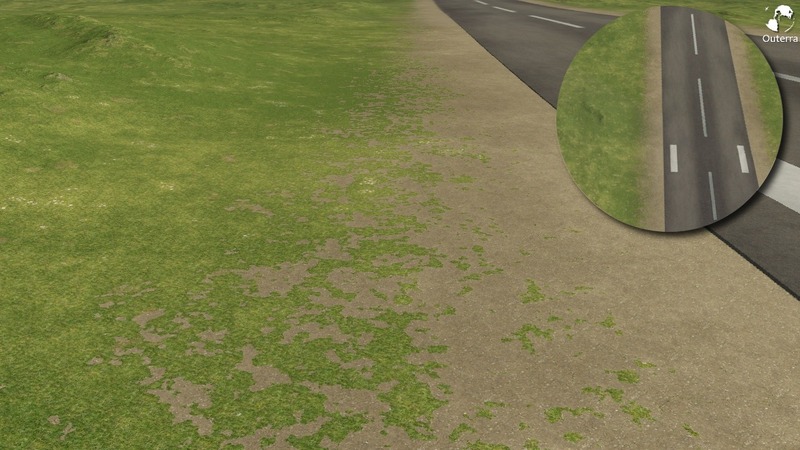 I realise this is early days but can you support more naturalistic blending between the asphalt, dirt skirting and grass? The dirt should "bleed" over the asphalt just a little and the grass over the dirt. Maybe it could be an option, hard versus natural edges? As you can see the runway has asphalt pavement and it's raised a bit. This will always be a hard edge, although the line may be broken by fractal a bit yet. Like the edge in the transition between the gravel and the original material. Yet that fractal edge is not right there - it should be a wider transition with continuously changing average material coverage, but that will come later as it's needed for land type changes anyway. Of course, with proper concrete runways the edge with dirt will not be hard either. It dosent look that bad. Thats how the sidewalk infront of my place looks like. Has that recently trimmed grass feel to it. It would look blended if the grass had actual grass blades sticking up. You would t notice it that way. Also about the scenery editor, what kind of features are you planing on implementing? That raised asphalt looks really good! When you talk about the gravel/grass transition ("wider transition with continuously changing average material coverage") do you mean that the gravel and grass will be "blended" to varying degrees, ie seeing patches of gravel intermixed with grass in the "transition area"? At the moment the gravel/grass transition is still a "hard edge" even though its not straight line. Is it possible for Outerra to support custom textures? Runways have a lot of variety with regard to their markings and material. The same question applies for cloud/road/land textures. If you're interested have a look at REX (http://www.realenvironmentxtreme.com/) to see how FSX/Xplane textures can be extended by 3rd parties. Please consider supporting similar texture moding for Outerra. Let's take it to a more contrasting area first. The same thing applies to transitions between climate types. Surely a transition from savanna to a desert doesn't mean that up close there's a Schrodinger's cat of a half-grass half-sand green-yellow blend of materials, yet from the distance it looks exactly like that: a varying blend of grass and sand colors. Up close, though, you'll initially find patches of sand between grass, gaining on average surface area as you progress deeper into the desert, until there are just patches of grass in the sand, gradually diminishing further in. That's what I call fractal blending: from distance it gives the expected colors of blending materials, but up close the edges are still hard, of well defined materials. Only a thin blending stripe to reduce noise from aliasing. It is possible, but it has to be made compatible with the procedural system in order to be able to generate the ground-level detail. In FSX/Xplane you are just throwing amounts of textures at the system, it's about streaming heaps of data and you have to have an autogen to get the detail everywhere. We are aiming for persistent and exactly defined world. In short it's different and old principles cannot be applied directly, but we want to provide tools that will make it possible in a way. Markings are another matter - they can be added as vector overlays. It's encouraging to hear this.... hopefully Outerra will excel in making the modelled world look natural. Can't wait to see how rivers, lakes, coastlines will look!